It was the sound of Seagulls outside (what sound do seagulls make? 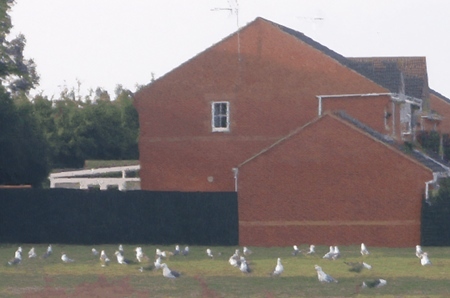 [link]) Well House Manor that go me wondering yesterday "why have we got so many seagulls around here, when we're so far inland". And as I was teaching a "learning to program in PHP" day, I did a bit of research to find out something about seagull populations and population growth, and wrote a program to extrapolate forwards. Being PHP, the results are presented as a web page - you can look [here] to find out how many years it will be, at reported rates of growth, before there are more seagulls than people in Bristol. And you can look [here] if you want to see the program and web page that I wrote. As the text in my sample page says, it's dangerous to extrapolate too far - especially as factors are changing; steps are being taken (as the article referred to in the page points out) to control seagull numbers - money is being spent on this control rather than buying biscuits for internal meetings, it seems. And as populations grow at extreme rates (as been happening with seagulls), there gets to be a point where other factors start to click in. When I woke on Sunday morning, I didn't know much about the seagull population (nor whether it's safe to eat them raw), but now I do. I marvel at facts learned every day, and I'm thankful for the opportunity to learn.